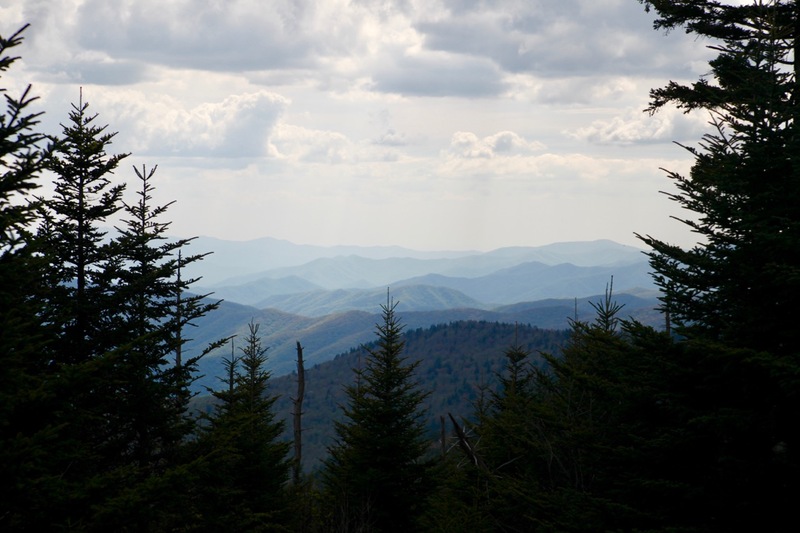 This week, Henri and I camped and hiked in the Great Smoky Mountains National Park. It was our second visit to a U.S. National Park after the Everglades and a highlight of our journey so far. Here in North America, you see the consumer side of American culture (Gatlinburg, Tennessee) but then you take a dirt road for 5 miles, a 4 mile trail and you will see the wild side… a bear, a waterfall that’s only yours, butterflies having a party, a sunbathing snake, amazing mushrooms, the tallest tree, the purest sound of the river… the origin of everything. I wonder: will I find such undisturbed nature again when I go back home to Old Europe, where fauna has almost disappeared, killed by too many centuries of human civilization? Will my path cross the path of so much beautiful, untouched nature there? Should I never go back home and buy a wooden cabin somewhere in the U.S. mountains? Is it possible to find this intense feeling of happiness and authenticity outside of nature? Great Smoky Mountains National Park is located in both Tennessee and North Carolina. Access is free.